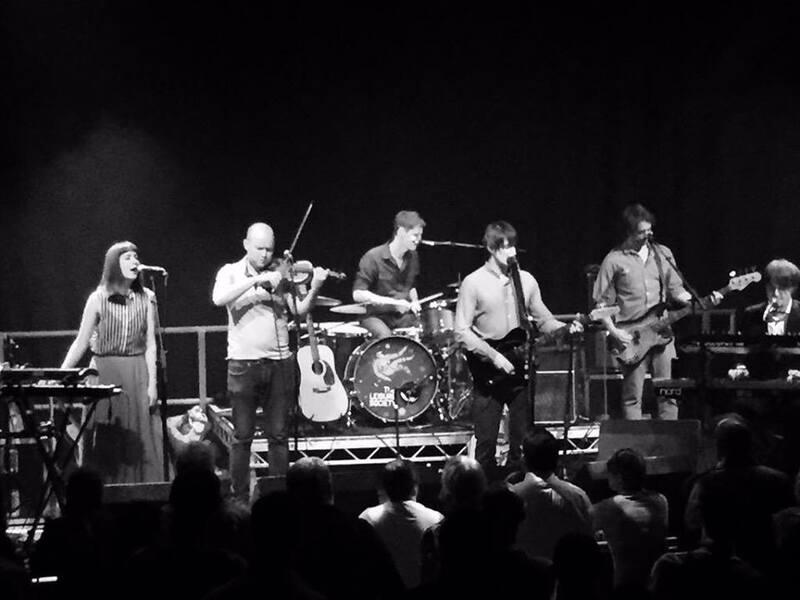 The Pictish Trail and Monoganon--A great night out! I can’t remember the last time I saw a major pop or rock act perform live. 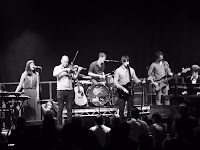 Over the past few years I have been going to small venues and discovering original new music by bands and solo artists who take no heed to what is presently trendy or fashionable—they just do their own thing, and they are all the more refreshing for it. A few years ago I was looking up cover versions of Gary Numan songs and found a folk version of “Cars” by The Leisure Society. Believing a good folk version of the famous electronic hit couldn’t be done, I played the performance on YouTube and was left feeling astonished. I then checked out their own material, including the heart rending “Last of the Melting Snow” and the catchy “Save It for Someone Who Cares” and I was hooked. It was while I was seeing The Leisure Society at Clitheroe’s The Grand venue that I discovered Sweet Baboo, one of the support acts that evening. Real name Steven Black, he performed his original compositions “The Day I Lost My Voice” and the ballad “Motorhome” and the spell was cast. I bought his album Ships that night. 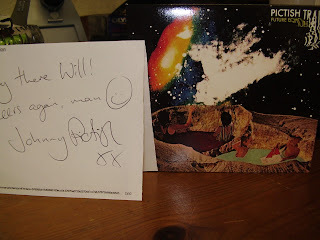 I went to watch Sweet Baboo perform his own set in a cafe in Manchester some months later and then again at a pub where the support act was The Pictish Trail. The latter is the stage name for Johnny Lynch, a self-proclaimed recluse from the Isle of Eigg, off Scotland. Instead of doing a set as the support act before Baboo came on, the pair performed the whole evening together, alternating one another’s songs. A review of the evening by one scribe on the internet hailed it the best concert he’d been to all year, and that included a gig at the O2 arena in London by U2!! 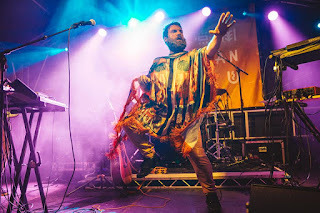 Last week, I watched The Pictish Trail on his own tour, playing a delightfully cosy venue in Hebden Bridge to promote his new album Future Echoes. But before the delights of Mr Lynch and his band, we were treated to what has to be the most bizarre act I have ever seen. Known as Monoganon, this thirty-something young man emerged from the stage door. Dressed in a peculiar homemade outfit (black leggings, a hoodie with white ‘wings’ joining his sleeves to his body, and a face mask), he switched on a laptop and fired up his LCD screen at the front of the stage. As ethereal electronic music filled the small hall, the strange entity picked up a microphone and performed a monologue about time, aliens, DNA and the like, and then the singing began. The screen displayed a hodgepodge of home movies while the gentle voice sang serenely. Monoganon was walking about the audience as the presentation went on, so I didn’t realise he was actually singing live until he came fully into view. I thought we were being played a CD of his album and he was simply mooching about while it progressed! As one song ended, another immediately began. “There aren’t that many gaps for applause in this,” he said, “but I will leave a couple near the end.” I wondered whether anyone would clap once the presentation was over. Just as I was beginning to get weary of the videos, half way through a song, Monoganon produced a jewellery box and explained that he was interested in photography. He opened the box and invited members of the audience to get a photo to keep. When the box reached me, I assumed there would be some advertising or a web address on the back of the picture—but no, it was just a photograph of a cottage in some wilderness place. The singing resumed and he made his way over to where I was sitting. He put the jewellery box on the floor and opened another compartment, from which he took an elaborate wire amulet. He looked to my friend and me and invited, “Will one of you help me put this on? It’s my medal for finishing the performance.” My mate was reluctant, so I leaned forward and placed the amulet around his neck. When the song ended he thanked the audience and received an enthusiastic round of applause. I think, like me, most were wondering what it was they’d just experienced. But, like me, they knew they’d enjoyed it. 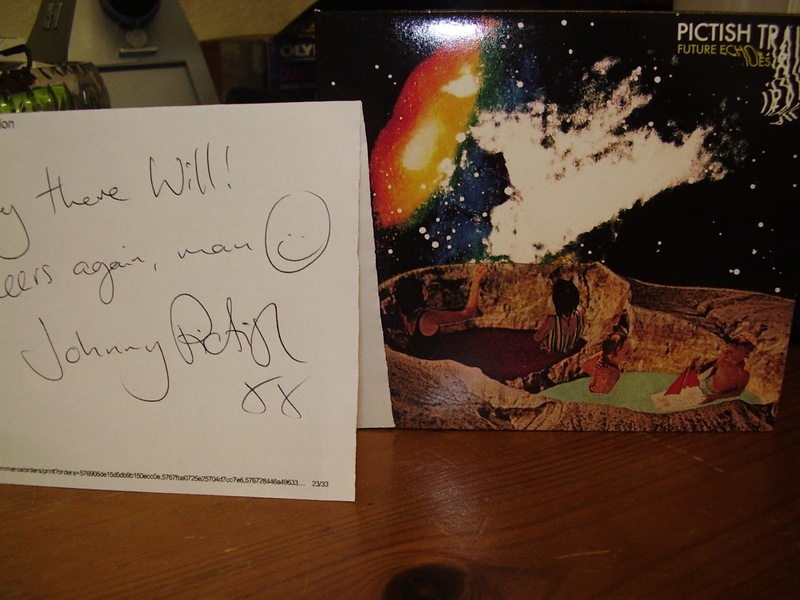 And then came the main act—The Pictish Trail. I had really enjoyed his debut album SecretSoundz Volumes 1 and 2 (Volume 2 is by far the best). There was such an eclectic mix of acoustic guitars, gentle ballads, accordion, and Nineties style dance rhythms, and it was captivating. I don’t normally like those thumping synthesiser dance tracks, but because Johnny’s voice is so soothing and melodic, the paradox works. I’d never heard anything like it. So when I knew he had made a new album called Future Echoes, I wasted no time pre-ordering it. The opening track, “Far Gone (Don’tLeave)” is based on the movie and TV series Fargo. He captures the essence of those stories in the lyrics so well, and the bleakness of that snow covered town is reflected in the music. My favourite song, though, is “Dead Connections”, which is partly inspired by the passing of his mother. Death and decay are subtly hinted at throughout the album, but not so as to depress the listener. Quite the opposite, in fact. Much of the record is uplifting. The songs were reproduced live admirably, with Johnny on acoustic guitar and vocal duties. Monoganon took to the stage, sans face mask to man the sound effects and provide backing vocals, while the lead electric guitarist and drummer gave it all they’d got. The young woman on bass was fascinating to watch (aren’t all bassists fascinating to watch?) as she expertly and seemingly effortlessly cut the grooves. Pictish himself wore a colourful shroud over the top of his casual clothes—his jeans still visible underneath, and his baseball hat completely at odds with the image of an enigmatic soothsayer. And we got our money’s worth too, as the whole album was played, and a few older tracks were thrown in for good measure (although not the ones I was hoping for. Hey-ho). After the show, I made for the merchandise desk and I shook hands with Johnny. He remembered me from a previous gig, which was nice. I asked Monoganon if he would sign my photograph. He was so flabbergasted, he had to get Johnny to break open a pack of felt tip pens. I asked him if the songs he’d played were available on CD. He told me they were available to download from his Bandcamp page. But I wanted a CD, so he showed me the only CD he had left, that of his previous release Family. It came with a self-made fanzine. I bought them for a tenner. Again, he seemed rather taken by my enthusiasm and threw in an LP vinyl record of Family as well. That was very kind of him. The following day I read the fanzine. It had two well written essays in it, one about what makes a true family and one about how we might be defined by the material things we purchase. He also explains that ‘Monoganon’ is a word he invented based on the real scientific word for a twelve sided genetic cell and the Buddhist meditation chant ‘Om’. Everything about him is nourishing. The CD isn’t too bad either. Good for times of solitude or a long and secluded drive. So, I love my music ‘finds’. 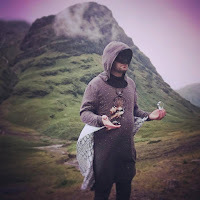 The Leisure Society are so talented and clever, Sweet Baboo is articulate and sharp, yet tugs at the heart strings, and Monoganon is completely original. And The Pictish Trail? His song “Dead Connections” is on constant auto-repeat in my head. Les Dennis in "Down the Dock Road"
McKenna (Andrew Schofield) confronts Granddad (Les Dennis) in Alan Bleasdale's powerful play. 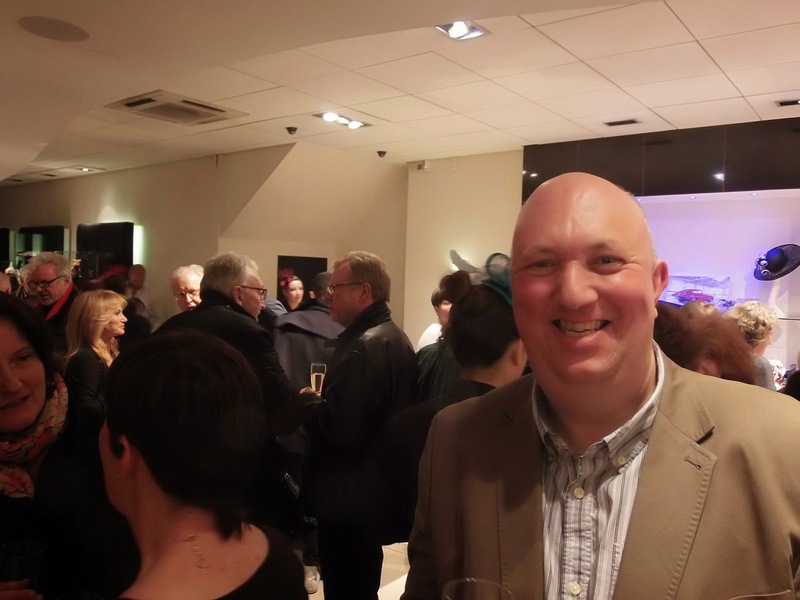 I had a superb time a couple of weeks ago watching actor Les Dennis in a new version of Alan Bleasdale's Down the Dock Road. When the original version debuted forty years ago, Dennis starred as the young security guard assigned to watch over the motley crew of waterfront workers. He was so taken with the script he bought the rights from Bleasdale, and now has co-produced with him this new incarnation where he (Dennis) plays the Granddad character. 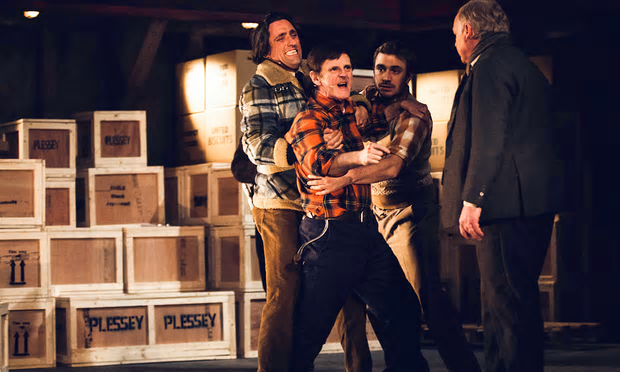 The play depicts the lives of men working on the docks in Liverpool. Each has an ambition he is trying to fulfil, including Mickey (Daniel Taylor) who imagines himself escaping this life of hard graft by auditioning for a TV talent show, and the appropriately nicknamed Mastermind (Paul Duckworth) who laments the lack of a decent education and wonders if he may enrol in college as a mature student. One can't help feeling that neither gentleman will ever reach their goal. Union man McKenna (Andrew Schofield) is the centre of the piece, he being framed by big shot and ex-policeman Marley (Conrad Nelson) so as to gain total control of his little empire. But one feels the wind of change blowing across the stage as the play unfolds; it's a story of changing eras and what happens to people when the old ways are abandoned. It is also a tale of corruption, from the humble labourer to foremen, police constables, to high ranking politicians. It's not all doom and gloom, though. There are plenty of laughs, and it's obvious Bleasdale's is the same pen that would later give us Yosser Hughes and the television series Boys From the Black Stuff. All the actors shine, the play being perfectly cast, but the final scene is owned by Les Dennis and Andrew Schofield, who put in an emotionally powerful last moment. I can do nothing but praise the set design and Hannah Chissick's direction. Down the Dock Road played from March 11th to April 9th, 2016, at Liverpool's Royal Court theatre, but it wouldn't surprise me at all if it ended up touring the UK. If it does, you must go and see it! Autism Awareness has been highlighted a lot recently, with items in the news about it, and the BBC Television drama The A Word. A piece that caught my eye this week was in The Guardian by Sara Barrett. In this, she points up misconceptions, assumptions and generalisations about the condition. I think it is becoming more appreciated that autism is an umbrella under which many variations are gathered. At one time, 'Autism' meant someone who could not communicate themselves (in extreme cases not even able to speak), obsessive to the point of being able to recite the telephone book, and rocking back and forth and screaming whenever their strict routine is changed. But now, people do see there are related conditions like Asperger's syndrome which have an even broader spectrum all to themselves. In fact, in recent times, there has been a call to abandon all the subdivisions in favour of just one all embracing definition: Autism Spectrum Disorder. Ten years ago, I gave a talk on my expression of Asperger's syndrome and my book The Feeling's Unmutual at John Moore's University in Liverpool. At the event, the audience, consisting of psychologists and other professionals as well as people on the spectrum, were asked if they felt that Mark Haddon's bestselling novel The Curious Incident of the Dog in the Night-time accurately depicted life on the autism spectrum. Interestingly, all the psychologists and specialists present thought it did and everyone on the spectrum said it didn't. For the latter, the protagonist Christopher was a textbook case—he had his obsessions, was preoccupied with logic, displayed little empathy (even using emoticons to explain the expressions on people's faces), and spoke in a monotone voice. It was as if Haddon had read Dr Tony Attwood's Asperger Syndrome—A User Guide for Parents and Professionals and personified all the key diagnostic criteria. In 2013 I was invited to join Mark Haddon on the BBC Radio Four programme Saturday Live, presented by Sian Williams and Richard Coles. Mr Haddon was there to talk about the new stage production based on his book, and I was invited to talk about what it's like having Asperger's syndrome. When asked about the Asperger label, Haddon said he didn't have any specific condition in mind. Asperger's isn't mentioned in the text of the book at all; it's a tag his publishers slapped on a particular edition of the book. He said the character Christopher came out of a desire to report the events of the story in the first person in a monotone voice. This is consistent with what he said a few years previously when interviewed on a TV documentary about changing standards in children's fiction. He said it struck him that swearing and cursing was really funny when reported in a flat monotone, and so decided to do it all the more in Curious Incident. One of my personal obsessions is how swearing is part of neurotypical communication, particularly amongst males. For example, when a man enters an all male peer group for the first time, to break the ice he is asked what he thinks about some recent sporting event, and when the conversation gets under way someone will drop in an expletive. Then the other members of the group will start to slip them into their comments too. If the newest member responds likewise, everyone present is happy—the bonding is a success. I find this really annoying because it is superficial and the words used don't fit the sentences grammatically. So I didn't identify with Christopher in The Curious Incident, nor did I appreciate the amount of swearing in the book. I didn't think people would talk to Christopher like that so much. Parents tend not to do it to that extent around their children, and a policeman at a railway station who realises Christopher is the boy everyone is looking for certainly wouldn't. But for all that, I did like the book and I'm glad I've read it. Whether it's a generalisation of autism or not, it still puts the condition in the spotlight, and that can only be good. Throughout my young adult life, I discerned that I didn't connect with people in quite the same way that other people do. At secondary school I was sent to talk it out with a sympathetic teacher. She asked why I was struggling to settle in, so I told her that 'everyone is false'. I'd observed that my peers changed their behaviour and even their views to fit in with the majority opinion. They did this because they were afraid of being themselves. I said I didn't do that and it was why I struggled. Well, you can imagine how that went down! Often I was told I had a chip on my shoulder, that I spoke in a polite but slightly aloof tone, and was judgemental. All I thought I was doing was telling the truth. The transition from primary school to secondary school had been a severely traumatic one. I imagined the next transition, from school into the workplace, would be one of relief, that I would now mixing with intelligent, sensible, mature people. What a shock I got when I started my first job. The situation was no different. It hit me then that there are unspoken rules mutually agreed by the majority when it comes to communication and attitudes, and if you refuse to participate, you will be ostracised. I was also plagued by obsessive thinking, and this led to rigid perspectives and inflexibility. All this impeded my attempts at trying to make new friends. In my teenage years, I had no friends my own age. I preferred the company of older people. And then there was my obsessive preoccupation with various television programmes, especially Doctor Who, The Tripods and The Prisoner. These all shared common threads relating to questioning the things people take for granted and being true to oneself. I was an emotional boy and often overwhelmed with confusion and romantic notions. The struggle to control these powerful feelings led to my identifying with Dr David Banner in the television adaptation of The Incredible Hulk. I knew what it was like to be a mild, gentle natured man, but be engulfed by mounting emotions. I was also heavily preoccupied with the loneliness of David Banner. By my mid-twenties, I was seeing a clinical psychologist. She put my social awkwardness, anxiety and depression down to a series of traumas I'd endured in my early life rather than a neurological condition. I didn't discover Asperger's syndrome until 2003 when journalist Gary Gillatt wrote an article called 'The Fan Gene' for Doctor Who Magazine. Then there was my rock star hero Gary Numan who had identified himself with the condition. Finally, I saw the BBC Two documentary My Family & Autism, presented by 14 year old Luke Jackson who himself had Asperger's. I knew then that this was the thing which described what had been 'wrong' all my life. What fascinates me now is that I was writing about the traits of the condition before I knew I had it. Way back in 1996 I had created this character, a robot school girl, an android called Anne Droyd. With no preconceived ideas and beliefs, Anne questioned everything. Like me in my teens she was at odds with her human peers, but unlike me, because she had no emotions, was totally unflustered by their reaction to her. I wrote Anne Droyd and Century Lodge up for proper at the close of the year 2000 and published it with CK Publishing Ltd in 2002. A year later, my life would be changed for the better thanks to the discovery of a tag, a label—Asperger's syndrome. Another twelve months elapsed and Anne was republished by Jessica Kingsley Publishers as an 'Asperger adventure'. While Anne has a number of Asperger traits, because she's a machine, she isn't ever described as having the syndrome. But in my teen novel The Blueprint, the protagonist Liam does have the condition. I thought up the character and the surreal dreamscape he gets trapped in way back in 1996, but didn't give him Asperger's until I finally wrote the book in 2012. With communication issues he has and his worldview, it made sense to connect Liam to an autistic spectrum disorder. Now I understand my own history and personal development better than ever, and as a result handle people better than I used to do. I still have my phobic moments and obsessive phases, and I am reminded by them that I will likely never totally conquer it, but by having it defined I am much happier and content. Saturday Live Original Blog Post. The Tripod at the village pond in episode one. The real setting is Friday Street in Dorking, Surrey, UK. The banner of the blog shows me in the same location in 2010. "The Tripods are coming! The Tripods are coming!" declared the BBC continuity announcer. As villagers dressed in period costume looked on, a giant metal foot plunged into the pond, followed by a second and a third. Then a tentacle swept down from the mushroom shaped hemisphere and plucked a teenage boy from the jetty and placed him in the belly of the machine. When he emerged, he had the most serene expression on his face, his eyes glazed with contentment. Then he removed his trilby to reveal the wire mesh of the Cap woven into the scalp of his head. As the grand fusion of electronic-orchestral music made its crescendo, the announcer said, "The Tripods are coming to BBC One!" This was in the autumn of 1984. I was 14 years old and already hooked. The programme was the brainchild of producer Richard Bates, son of Darling Buds of May author H.E. Bates, ever a dab hand at spotting potential in classic novels and turning them into television serials. He enjoyed huge success with Darling Buds, with John Wyndham's Chocky (made into a television serial for adolescents by Children's ITV) and R.D. Wingfield's A Touch of Frost. The Tripods was based on a trilogy of novels by John Christopher, who had won notoriety in the early 1950s with dystopian future novel The Death of Grass, and later in the 1970s with The Guardians. The first book of the Tripods trilogy (published in 1967) is The White Mountains. Written in the first person, this tells the tale of 13 year old Will Parker who lives in an idyllic village in the south of England. It has the trappings of a quaint peaceful place in pre-industrial times, but is actually a hundred or so years in our future. Technology is all but eradicated and people live simple pastoral lives without a care. Every summer the Tripod comes to perform the Capping ceremony. To the populace this symbolises one's crossing the threshold into adulthood—in reality the Cap is designed to inhibit independent thinking, creativity and rebellion. The peace that humans now enjoy comes at a cost—the freedom to think. Will Parker only begins to question the status quo when his cousin Jack expresses doubts about his own Capping and the control that the Tripods hold over humanity. When Will catches up with him after his Capping, Jack dismisses his worries as 'nonsense'. Will can't get over the difference in him. Will's destiny is sealed when shortly afterwards he comes in contact with Ozymandias, a crazy vagrant for whom the Capping has been unsuccessful, leaving him brain damaged. Only he isn't. It's all an act, as Ozymandias rambles the countryside looking for youngsters to send to the Alps, where other un-Capped people are plotting to destroy the enemy. Will and his cousin Henry set off for the White Mountains. They cross the sea to France where they are joined by the gangly Jean-Paul, nicknamed Beanpole by the boys. At a French chateau, Will falls in love with Eloise and is seduced by the material wealth of her parents, the Count and Countess. The spell is broken when she willing offers herself as a slave to the Tripods to serve them in their mysterious city. Suspicious of Will, a Tripod implants a tracking device to see where he is going. When the boys discover it, they dig it out, and with the mountains in sight, are hindered by the weakened protagonist. In a frantic moment, the boys succeed in destroying their pursuer, and make it to the camp of the Free Men. Now, I'm sure you can see that this would make a splendid Saturday teatime show for kids. Richard Bates certainly thought so. The trouble was, having acquired the rights from John Christopher, he now had to sell the idea to the BBC. The Corporation would want it to fit the format most appealing to broadcasters in the United States, so they could sell it to them. American seasons were broadcast in blocks of 13, so Bates pitched The Tripods to the BBC as three series of 13. At 120 pages, though, there was no way The White Mountains would stretch to 13 half hour episodes without a bit of padding. It was script writer Alick Rowe's job to turn it into a television serial. All the before-and-after-Capping discussion with Jack was abandoned in favour of showing the Tripod arriving in the village in the opening shot. Personally, had I been adapting the book, I would have made Episode One all about Jack's doubts (as the first chapter does). Will's discussions with Ozymandias, which take up the whole of Chapter Two, are condensed into one scene in the first episode. So it wasn't simply the lack of material that made it necessary to pad out the series, but Rowe's and Bates' decision to leave out crucial character developing scenes. The trek to the sea thus drags on a bit too much, as does the Captain Curis sequence. The boys meeting Beanpole takes up Episode Four. All this with hardly any shots of the Tripods themselves. Then the boys spend four episodes at the chateau (two would have served that segment far better) with no Tripod action until Eloise is taken to serve in the City of Gold. The sequence where Will is snatched from his horse by a Tripod is brilliantly handled, as is the discussion about what the Tripods might actually be. But then the series gets stuck again, this time at Vichot's vineyard, where there is a lot of grape crushing and falling in love. To Alick Rowe's credit, though, there is a very good additional storyline involving Madam Vichot's failed Capping. The enemy know it failed, but they don't care because she isn't rebellious. The plot of the book returns when the boys blow up a Tripod and make it to the camp of the Free Men. The serial was a long winded affair and very dull in places. A lot of my schoolmates grew weary of it and stopped watching. But I was hooked by the core idea, that of a controlled society where everyone was the enemy. The Tripods themselves may have been seldom seen, but their influence was all encompassing. Also, production values were high when compared to other UK shows from the 1980s. It looked lavish, the Tripods themselves were magnificent, and the music score sounded classy. I was thrilled to hear the continuity announcer say that the series would return the following autumn, and that Ken Freeman's theme music, a hybrid of synthesiser effects and orchestral sounding sweeps, was available on a single record. 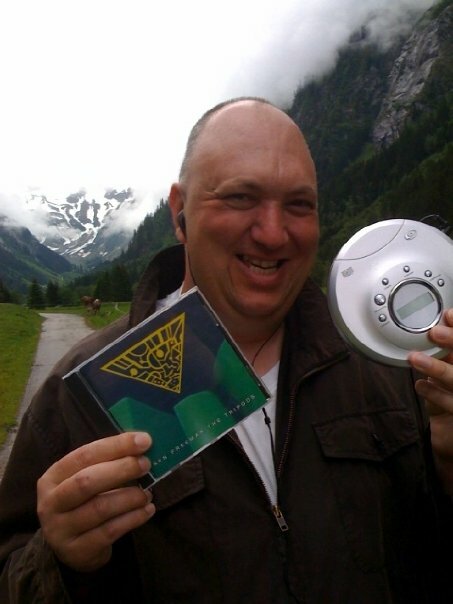 'The White Mountains' of Austria, 2008. I could not wait until the following autumn to find out what happened to Will, Henry and Beanpole, so I bought John Christopher's book. Penguin had reissued the three novels with BBC covers, each carrying the series logo, a photograph of the young stars, and the legend 'Now a Thrilling BBC-TV Series!' I plumped for the three-in-one release The Tripods Trilogy. I loved re-reading the events of the series so far, and was very pleased to find that it was faster paced and that the vineyard stuff wasn't present. After completing The White Mountains, I went straight into Book Two, The City of Gold and Lead. In this, Henry stays in the mountain camp, and Beanpole fails to make it into the Tripods' alien city. But Will and his new companion Fritz do get in--and my, what a truly alien environment it is, as we find that the Tripods are merely machines and the true enemy are the alien Masters. They came to put a stop to our warlike ways through the imposition of the Cap, but were now determined to colonise the Earth. I wondered how all this would be represented on television. Series Two was adapted by Christopher Penfold. For the most part it was faithful to the book. Will, Henry and Beanpole train with other 'free men' to pose as Capped athletes and be chosen to serve in the City of Gold. Henry is held back to work with the mountain community in reconnaissance missions, while Beanpole, Will, and a German character called Fritz Eger travel to the venue of the Games tournament. In the book, the boys get trapped on an island with an un-Capped hermit who refuses to let them leave. In the series, this is dropped in favour of an episode where the boys attend a wedding and are helped to the Games venue by two girls. Beanpole fails to qualify for selection, but Will and Fritz are taken into the City. In The City of Gold and Lead, the alien atmosphere is dense and hot, and the gravity is much stronger than normal, wearing down the slaves like a leaden weight. This causes premature aging. The elderly and infirm there are actually only in their twenties. However, while the size and scale of the City is impressive in the television series, the poisonous atmosphere doesn't really come across. Will is chosen to serve master West 468, a botanist, while Fritz ends up with the slave gangs hewing out a massive cavern to house some machinery on its way from the Master's home world. In a diversion from the book's plot, Fritz wangles himself into an elite of highly trained humans and learns that the Masters themselves are subservient to a higher collective intelligence. Learning that the Masters are set on converting Earth's atmosphere to suit their needs (a side effect of which will be the annihilation of the human race), Will escapes the City. Beanpole finds him and accompanies him back to the mountains, but not before Penfold's script leaves the book once more and the boys join a travelling circus as a means of disguising their journey. As Ken Freeman's triumphant theme music thumped along, I was bemused to find that no announcement was made about the third series. A few months later, the head of English at school informed me that the third series had been dropped due to poor viewing figures. The long drawn out nature of the serial (particularly in the first series) had put people off. Richard Bates so upset to find that the final third of the trilogy would not be filmed, he moved the line 'Has it all been for nothing?' forward in the script so that it would be the last line spoken. The only way I could find out how the adventure ends was to read The Pool of Fire. 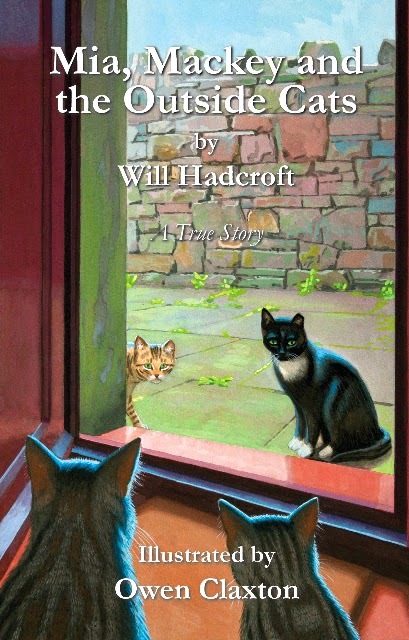 In this, Will, Henry and Beanpole are reunited with Fritz, who had to escape the City for fear he would be connected to Will's disappearance. The rebels manage to immobilise a Tripod and take its alien occupant prisoner. By a pure fluke, they discover that the Masters cannot handle even small amounts of alcohol. The race is then on to infiltrate the City again and pollute the Master's water supply with alcohol. Meanwhile, other rebels fly hot air balloons over the dome and drop explosives on it in the hope of shattering it. When every attempt fails, Henry lands his balloon on the dome and ensures that the bomb breaks it, killing himself in the process. He was what we would today term a suicide bomber. The rule of the Masters and the Tripods is over, humankind can now think and speak freely again. But before long, there are major disagreements and factions splinter off, leaving the human race as divided and conflicted as it was before the Cappings. I would go on to re-watch The Tripods TV series and revisit John Christopher's books many times over the next thirty years, I loved them so much. In 1994 I was delighted when Series One was released on DVD, and Ken Freeman issued a full album of incidental music suites to complement the two theme tunes he'd done for the series. About ten years later, I found the online fan community The League of Freemen, and befriended a number of fellow enthusiasts and, amazingly, some of the cast too. Jim Baker, who had played Henry in the series was now an HGV driver, and Robin Hayter, who had played Fritz, was a jobbing actor taking work in restaurants and the like between roles. The League met up a number of times with these two in particular. 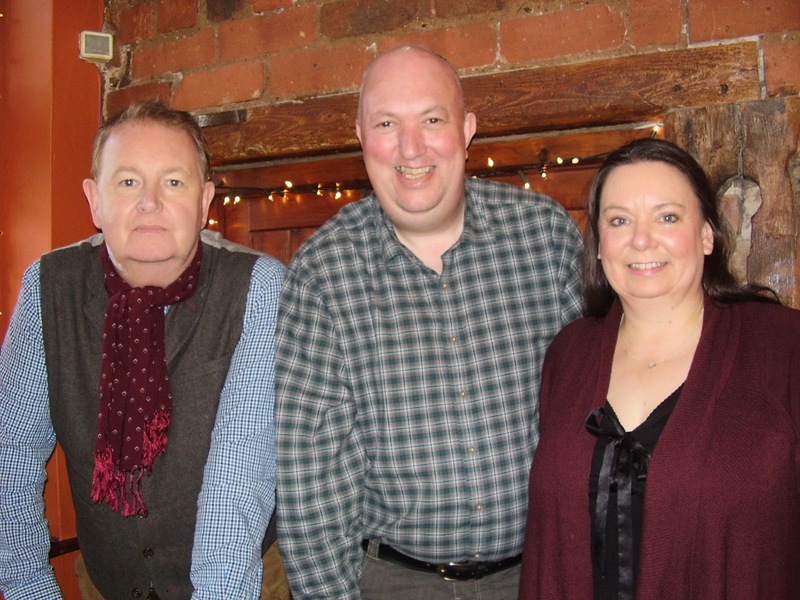 Other meetings involved Ceri Seel, who played Beanpole, and producer Richard Bates. League member Dylan Dawes, a BBC employee, was able to persuade BBC Four's producer of the strand Sci-Fi Britannia to commission a half hour documentary called The Cult of The Tripods. In this, Bates, Rowe, Jim Baker and director Bob Blagden were interviewed. 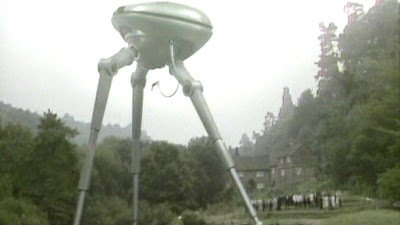 The programme became an extra feature on the updated The Tripods-The Complete First & Second Series box set. It was in 2003 when I was working on my autobiography The Feeling's Unmutual for Jessica Kingsley Publishers that I was asked to contact some of my heroes mentioned in the book. I was thrilled when Doctor Who actor Colin Baker got in touch. Then one day someone put me onto a website, stating that, 'A guy called Sam Youd is answering questions about the Tripods books. It seems he is John Christopher.' So I went and took a look, and sure enough, Sam Youd was answering questions about the Tripods and other John Christopher books! I dropped him a line and asked if he would consider endorsing The Feeling's Unmutual. What followed was a series of exchanges and an invitation to drop in for a cup of tea and a chat 'if ever you are in Rye, East Sussex'. Needless to say, I made sure I was in Rye, East Sussex! The day I met Sam Youd (John Christopher). November 2004. The meeting was utterly surreal. It took me a while to get going as I was so star struck. My wife kept the conversation fluid until I could get my head together. We discussed some of the themes in the Tripods trilogy, but he was keen for me to look at some of his other works. His own favourite was The Prince in Waiting trilogy (also known as The Sword of the Spirits trilogy). He invited me into his study where he signed copies of The Guardians and The Lotus Caves for me. BBC Four's Sci-Fi Britannia strand led to a resurgence of interest in John Christopher's dystopian future fiction when author Brian Aldiss praised Christopher's The Death of Grass for its gritty realism. This has since been republished as a Penguin Modern Classic, meaning that Penguin will never let it go out of print again. Both the Tripods and the Prince/Sword trilogies have been re-issued by mainstream publishers. At the height of his powers, Sam Youd was writing four novels a year to put food on the table and pay the mortgage. He wrote a number of non-science fiction books under the name Hilary Ford, as well as lesser known John Christopher titles. Sadly, Sam Youd passed away in 2012, aged 89. 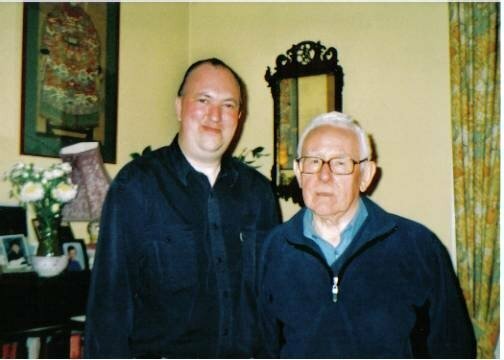 Of course, I was deeply saddened when his daughter Rose got in touch with the news, and now I treasure the memory of drinking tea with him in his living room. While the mainstream publishers focus on republishing John Christopher's best loved works, his family have launched The SYLE Press (Sam Youd Literary Estate) to bring back to life his other novels, including those written under the name Hilary Ford. 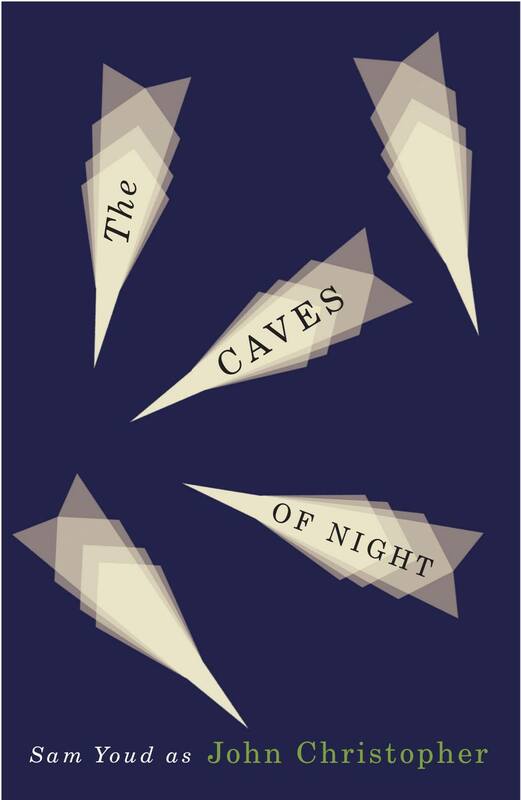 This month, The SYLE Press have published John Christopher's The Caves of Night. I shall certainly be buying it and adding it to my library. I feel I owe it to him for firing up my imagination and making me want to be a writer. The 1967/8 television series The Prisoner is one of the most unusual ever devised. It operates on several levels, and it's no wonder that nearly fifty years on people are still thinking about it. The programme was the brainchild of actor Patrick McGoohan, who had made his name as John Drake, a government agent who preferred to use his brain rather than carry a gun, in the series Danger Man (known as Secret Agent in the United States of America). Collaborating with McGoohan was writer-producer David Tomblin and script editor George Markstein. A man resigns his top secret government job and refuses to give his employers a reason, other than, "It's a matter of personal principle." At home he packs for a much needed holiday, but nerve gas is pumped through the keyhole of his front door and he is rendered unconscious. When he wakes, he finds himself held captive in a bizarre island village where no one has a name. Everyone is identified by number—He is Number Six and the Village chairman is Number Two. But who is the unseen ruler of the Village? Who is Number One? The Prisoner is determined to find the answers, while his captors are intent on uncovering the reason for his resignation. Over 17 episodes, the series examines the plight of the individual, the non-conformist, surrounded by people who are only too happy to tow the line. They want him to accept that he is just a number, to embrace his life in the Village. He is determined to maintain his personal integrity. The show satirises a number of revered institutions, including the political arena, the education system, psychology and psychiatry, to name a few. Behind the scenes, there were major disagreements between Patrick McGoohan and George Markstein as to what The Prisoner actually was. To Markstein, it was a continuation of Danger Man/Secret Agent. He saw the Prisoner as John Drake, and the series as an extension of the 'spy' genre. But McGoohan was much more immersed in the symbolism of it—the Prisoner was Everyman, the individual struggling with and resisting organised society and the pressure to conform. Four episodes from the end, Markstein resigned and left McGoohan to it. Not surprisingly, at this point conventional storytelling went out the window. In the final instalment, Number Six enters the lair of Number One and finally unmasks his nemesis. Instead of finding a stereotypical Bond villain chuckling and stroking a white cat, he found first an individual wearing a monkey mask, and then beneath that a clone of himself. Number One jumps and prances round the control room, laughing and jabbering like a monkey before disappearing through a hatch in the ceiling. The Prisoner escapes the Village with the help of other rebels and returns to London. The final shot is identical to the opening shot in the main title sequence: him driving in a sports car down a broad runway. Most viewers who followed the series right through in the late Sixties were left frustrated and angry by the lack of a proper conclusion. But decades later, people like me have loved it. Anyone who feels at odds with the world around them, who resents society's attempts at defining and pigeon-holing them, will love it. Fans not only enjoy analysing the different layers of the programme, but tend to be drawn to Patrick McGoohan himself, who was every bit as enigmatic and charismatic as the character he played. I personally love the interview he granted Warner Troyer in Canada during the 1970s. It's called The Prisoner Puzzle. and you can see it here on YouTube. Circa 1990, a pen pal of mine put me onto the series after I'd been expressing my frustration with the world and how intolerant it was of true individualists. I became obsessed with it. The symbolism appealed a lot—I could see what McGoohan was saying and I felt the same. When I started my first job, I felt very acutely the pressure to conform. And it wasn't just my employers expecting me to work to a particular standard either—it was everyone. I had to swear every other word, laugh at vulgarities, talk about the bosses in an undignified way, be deceitful, selfish, watch violent movies, give up the preoccupations of childhood and adolescence, and embrace the so-called adult world, orrrr be an outcast. I preferred the latter. I was eighteen and rebelling. But not in the way everyone else was. I was rebelling against the rebels. I had looked intently to the day I left school because that would mean leaving school culture behind and at last being surrounded by mature people. Or so I thought. What I'd found, though, was that school had been a template, a blueprint, coaxing me, guiding me and preparing me for the big wide world—and I hated it so much. The education system wasn't just teaching me mathematics, how to read and write, and where various countries were in the world, no—it was telling me how I should think, how I should be. The political system was backing it, the religious system was cushioning it, and the media (including newspapers, magazines and television) were drip feeding the conditioning to make sure it stuck. Well, The Prisoner was a godsend for me. It arrived in my life at just the right moment. 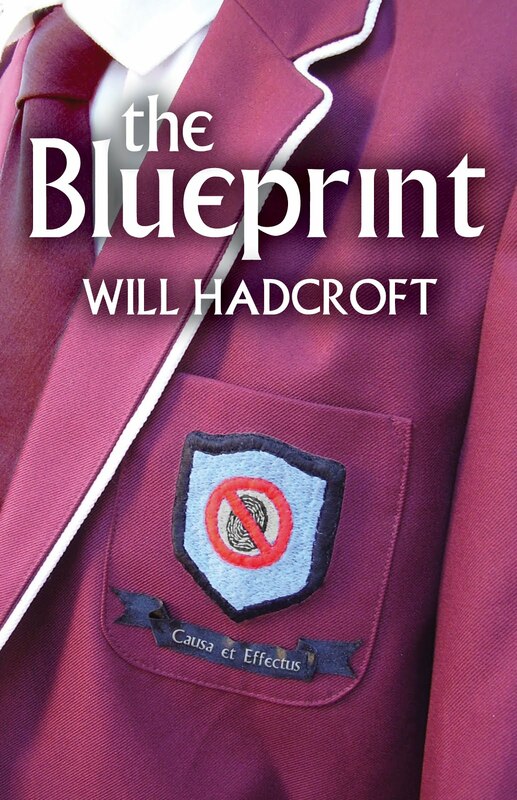 McGoohan's vision coupled with my own observations led to The Blueprint, a novel I planned in 1996 and eventually published in 2012. It's written in the first person from teenager Liam Creedy's point of view, as he dissects the world system and his own self in a coma state rich with symbolism. I feel it is one of my best works, and owes a lot to McGoohan and The Prisoner series. When my business partner Theresa Cutts and I saw that writer-illustrator Brian Gorman was planning on doing a biography of McGoohan's life leading up to The Prisoner, and was going to do it as a graphic novel in which Number Two interrogates the actor about his life in the setting of The Village, we just had to invite him to publish it through us at FBS. And we are so glad he has. 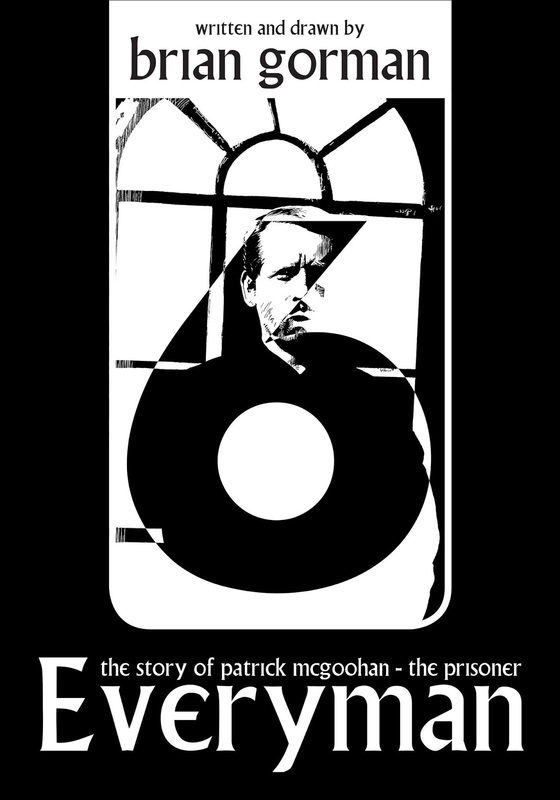 Everyman: The Story of Patrick McGoohan--The Prisoner is a superb book. We have published a limited edition hardback. If you order this, you will have it signed by Brian Gorman, and receive some exclusive giveaways too. The standard paperback will be released imminently, it will also be available to download on Kindle. The book is as unconventional and riveting as the actor who inspired it. It's always lovely to receive a letter or email in praise of one's work. A writer only truly knows how his efforts are going down when appreciative readers get in touch to tell him. Some years ago, I saw children's TV magazine programme Blue Peter editor/producer Biddy Baxter interviewed and she said that as a child she'd written a fan letter to Famous Five author Enid Blyton--and was deeply disappointed when Ms Blyton never replied. When Biddy joined BBC children's television, she vowed that every child who wrote to the programme would receive a personal reply from her. In 1986, I was such a recipient. Around the same time, I also had replies from Doctor Who actors Colin Baker and Nicola Bryant, as well as producer John Nathan-Turner. They made a lasting impression on me. Now, as an author myself, I always reply to every fan who makes contact, and will do so until it becomes physically impossible. "Hi Will, just asking did you write a follow up to Mia and the Woodshed Cats ? My daughter is going mad for a follow up. She can't put the other one down at the moment x"
Thankfully, there is indeed a follow-up. It's called Mia, Mackey and the Outside Cats (pictured). The stories are based on the real life antics of a stray cat who moved into the family home. My wife used to call out "Meow, meow!" to let her know she was going to feed her! Meow became Mia, and we found she'd had kittens in the woodshed next door. Then, after moving into our house, she had a second litter! Our new feline family were the source of merriment and free entertainment for some months, and I noted down the escapades that really touched me. These notes were then fictionalised as the two books. They are beautifully illustrated with full colour paintings by Owen Claxton. There is a third volume in the works. Fan mail serves as a boost, it motivates--there is demand! I really must get on with it. The final instalment will be called Mia and the Farmhouse Cats. Personally dedicated copies of Books One and Two are available to order from www.fbs-publishing.co.uk. The books are also available on Kindle. 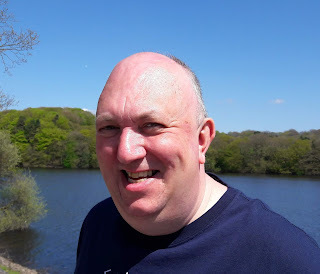 With Theresa Cutts, I have been approaching prospective authors, some virtually unknown, others known and respected within their peer groups, and one or two who are rather famous. Twice in the summer we enjoyed lunch with a top television personality. Those meetings threw up a number of ideas and even another author who may soon be working with us. It was a delight to meet these people, regardless of what comes to FBS Publishing as a result. 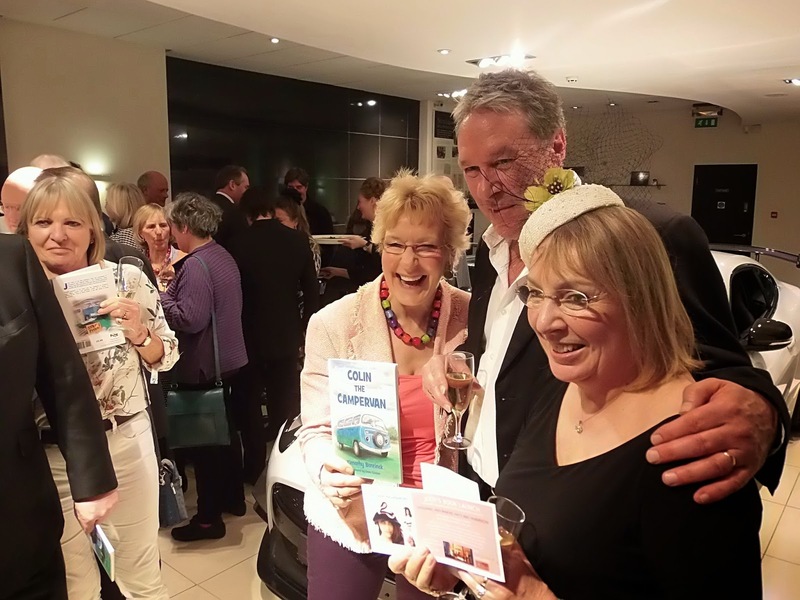 Theresa met up with Timothy Bentinck, who has completed a first draft of the new Colin the Campervan adventure. We are looking at that currently. We will be announcing a new project on 6.1.16--the date itself is a clue. I, for one, am really excited about this new book, as it treads fresh ground for FBS, and the author (and, indeed, illustrator) is very talented. A few weeks ago, Theresa and I had lunch with international bestselling writer G.P. Taylor, author of the hugely popular Shadowmancer. He's a fascinating man to talk to. He has penned a book that is quite different to what he is known for, and we're thrilled that he has chosen to publish it through us. We don't think there is anything out there that's quite like it! As for my own writing, I have made a start on the fourth Anne Droyd book. At the moment, it is going to be more of a novella--but if I get inspired, it might end up a full length novel like the others. I've also written one chapter of the third Mia book, Mia and the Farmhouse Cats. I might well end up publishing both in 2016. "COLIN THE CAMPERVAN" RELEASED IN MAYFAIR, LONDON! 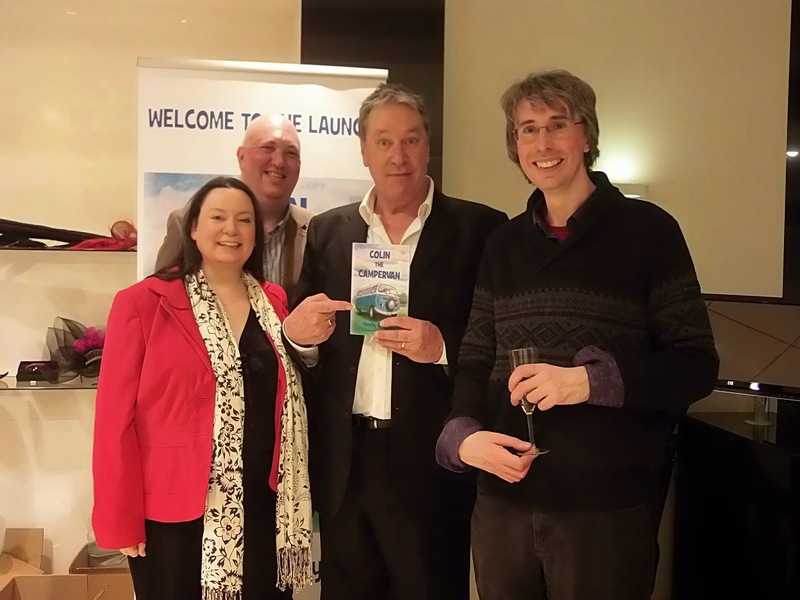 Above, from left to right: My FBS partner Theresa Cutts, myself, actor-author Tim Bentinck and illustrator Owen Claxton. Theresa and I found Tim's book on Kindle and asked him if he would like to publish a paperback version with new illustrations. He said yes! The London launch was attended by Tim's co-stars from the long running BBC Radio drama The Archers as well as other celebrity friends. Journalists and photographers were also present. Above: Plenty were in attendance and were thrilled with the release of Colin! Above: Tim Bentinck with his wife Judy and with Christine Hamilton, no less. Colin the Campervan is available to order from Amazon, and personally dedicated copies can be bought from our publisher page www.fbs-publishing.co.uk. We will post to anywhere in the world. When abandoned tabby cat Mia turned up at Ma and Pa Croft's farmhouse, little did they know she had given birth to kittens in the woodshed next door. As they cared for the cats, Mia slowly moved into their home. But then Ma and Pa got a shock ... Kittens again! Now Mia has six kittens - two in the woodshed and four newborns there in the house. This is the story of Mia and her kittens Tabby Girl, Socks and Mackey, their sisters Eva and Scarlet, and their brother Blue. Will Ma and Pa keep all the cats at the farmhouse, or give them away to new homes? Based on true events, these stories will touch the heart of every reader. I will sign personal copies and send them to anywhere in the world. Order this book (and/or the first book Mia and the Woodshed Cats) from www.fbs-publishing.co.uk. OUT NOW! What's All the Fuss About DOCTOR WHO? 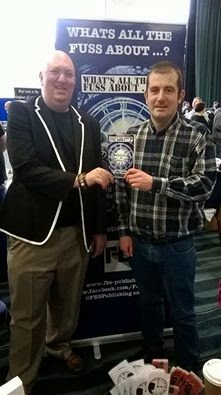 Former Doctor Who Appreciation Society coordinator Ian Wheeler and I have written and published What's All the Fuss About ...? An Introduction to Doctor Who. The above photograph shows us releasing it at Bolton Comic-Con on March 1st. Who is the Doctor, what are the Daleks and why is the TARDIS a police box? Here is a television programme that has been running for over fifty years and has seen twelve different actors play the title role, each a unique incarnation. Why are people so devoted to this phenomenon? What is all the fuss about? Will Hadcroft and Ian Wheeler present the basics, with an overview of each Doctor's era and recommended stories to try, delivering the essential information that you need to know, your introduction to a television legend. It is the perfect beginners' guide for anyone wondering where to start, and equally suited to the die-hard fan who wants be reminded of and relive the very best bits all over again. Personal copies signed by Ian Wheeler and myself are available from www.fbs-publishing.co.uk. We will post to anywhere in the world. Following the events of the first book, Mia and the Woodshed Cats, we are happy to announce that the story of Mia and her kittens continues in book two, Mia, Mackey and the Outside Cats. It is to be published soon. This is an enchanting and uplifting tale about following your dreams." 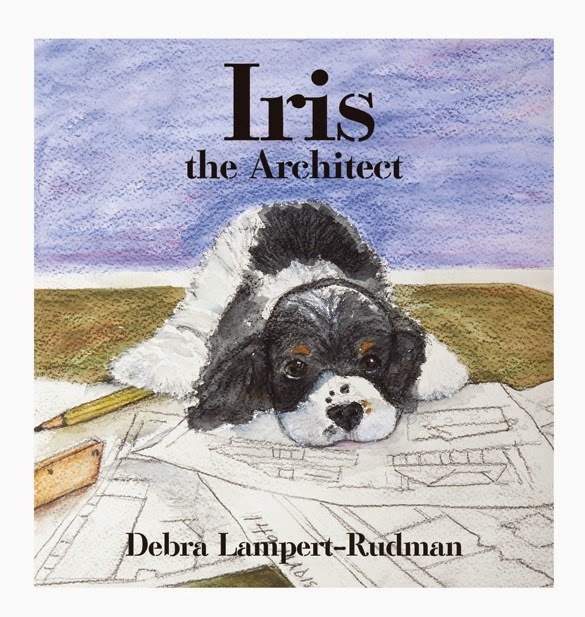 Iris the Architect is the first hardback children's story book from FBS. It's also our first title written by someone outside of the UK. The author, Debra Lampert-Rudman, is based in New Jersey, United States. The book is available from Amazon and can be ordered at your bookshop. OUR "CORONATION STREET" BOOK OUT NOW! 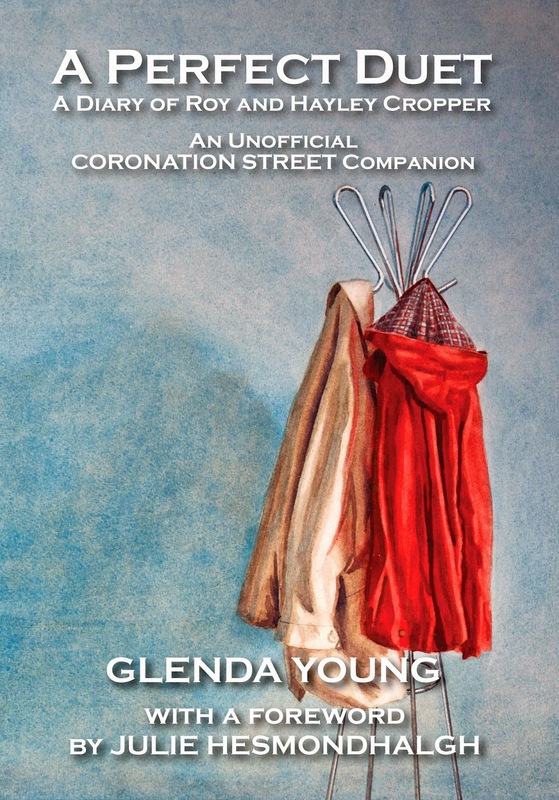 You may have seen Glenda Young's book A Perfect Duet - A Diary of Roy and Hayley Cropper in magazines like Inside Soap and TV Times recently. Well, FBS Ltd are the publishers! Glenda has been diarising every single episode of Coronation Street since 1995. When my business partner Theresa Cutts saw that Glenda was publishing yearly compilations of her blog to Kindle, I suggested she approach her to ask if she might compile all of the major storylines concerning Roy and Hayley into one handy little book. One of the challenges with this release was the cover. How do you show the browsing book buyer that it's about Coronation Street without using the Coronation Street logo, any photographs of the street itself, or any pictures of the actors? I suggested to Theresa that we might get our in-house artist Owen Claxton to paint two things that aren't copyrighted but that instantly scream 'Roy and Hayley!' to anyone who knows them - a drab looking mack, a red anorak, and a shopping bag. Once again, Owen has done a fantastic job, and our decision to do the cover in matte was the right one. People are telling us they stroke the cover! The icing on the cake is actress Julie Hesmondhalgh writing such a heartwarming Foreword. She's done us proud. Thank you, Julie. Regular copies can be bought from Amazon and all good bookshops. FBS Ltd & Signing "Mia"
Fabulous BookS (FBS) became a limited company a couple of weeks ago. Theresa Cutts and I felt it was necessary because what we have in the pipeline as a company might well call for it. In the meantime, though, like many other novelists, I continue to work at a day job. With the release of my first book aimed at younger children, Mia and the Woodshed Cats, I performed a signing for my colleagues. It went really well and everyone commented on the stunning paintings by Owen Claxton. He's a real find. All pre-orders have now gone out, and initial feedback has been positive. Owen's paintings for the follow-up, due in the summer, brought a lump to my throat. The stories are based on true events, you see. 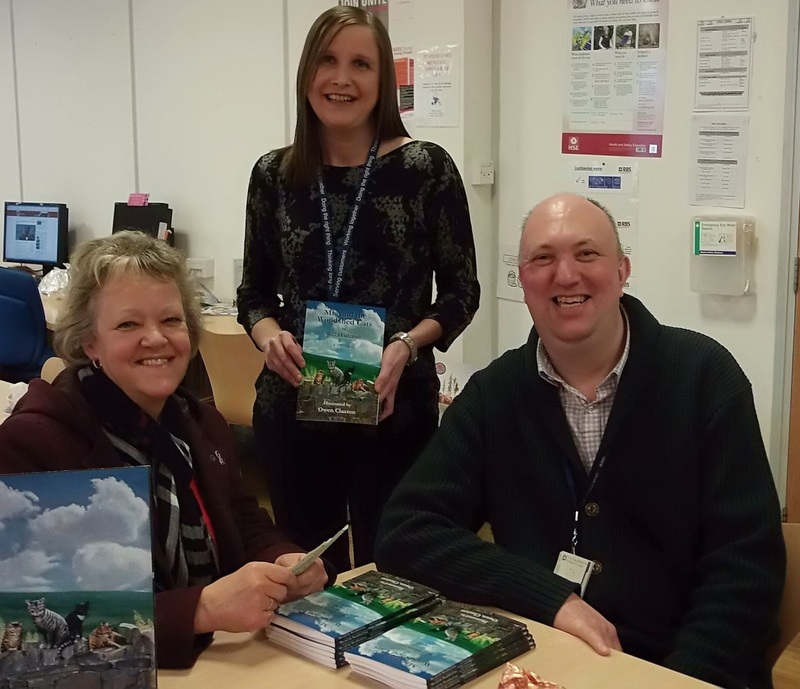 The above photo shows Angela Hunter (seated) and Lisa Hailwood-Smith collecting their signed copies.